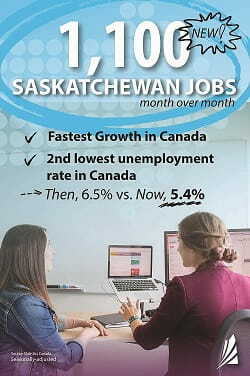 Saskatchewan’s unemployment rate was 5.4 per cent (seasonally adjusted) in January – tied for the second lowest rate among the provinces and below the national rate of 5.9 per cent according to Statistics Canada. There were 560,100 people employed, 1,500 more jobs compared to January 2017, including an increase of 4,900 full-time jobs. Employment in Saskatchewan was up 1,100 from the previous month (0.2 per cent), the highest percentage increase among the provinces (seasonally adjusted). There were 6,200 full-time jobs created month-over-month. Major year-over-year gains were reported for accommodation and food services up 2,300; public administration up 2,000; business, building and other support services up 1,700.